Sen. Cory Booker (D-NJ) is a master actor. 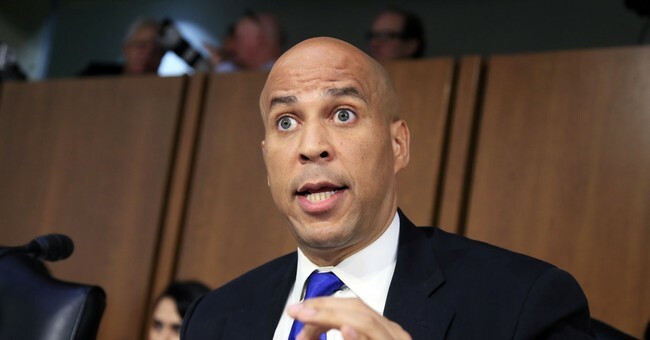 He had his “I am Spartacus” moment, where he said he would release confidential records relating to the Supreme Court nomination of Judge Brett Kavanaugh during the hellacious and tedious two days of testimony this month. It related to emails sent at the time Kavanaugh worked at the Bush White House. It had to do with racial profiling. The bombshell: Kavanaugh was against racial profiling after the 9/11 terror attacks. Oh, and these documents were already given the okay to be released publicly by the Bush team and the Senate Judiciary Committee prior to his hollow grandstanding. Now, with the allegations of sexual misconduct coming to light, thanks to Sen. Dianne Feinstein (D-CA) finally releasing a letter by his accuser that she received…in July. Why did she sit on it for so long? Why didn’t she share it with her Senate colleagues? Why drop it now? Well, maybe it’s due to the fact that it’s as crappy as a Ford Pinto. Christine Blasey Ford, who says Kavanaugh tried to sexually assault her in a drunken episode at a party some 30-plus years ago, made the allegation. Kavanaugh was 17 years old at the time. Ford cannot remember who owned the house where the party was held, how the party came about, or how she got there, but she does remember it was Kavanaugh? Mark Judge and Patrick Smythe, known as “PJ,” in her account have denied this incident ever occurring, some have even said that they cannot be sure a party even took place. Ford so far is unwilling to testify before Congress on these allegations. The Senate GOP has offered her a private or public hearing. Heck, the Senate Judiciary Committee has offered to come to her, sending staffers to conduct the interview at her California home. Ford is a research psychologist and professor at Palo Alto University. She also instructs at Stanford. It’s a delay tactic. Democrats want to hold off until an FBI investigation can be conducted. That’s wholly inappropriate. There is no federal crime, there’s no evidence, the witnesses dispute her claim, and she can’t remember key details. There is no federal crime to be investigated. This is a political issue—and a sector of the executive cannot be commandeered to do the committee’s work just because Democrats don’t like Kavanaugh. Sen. Chuck Grassley (R-IA) made that point quite explicitly last night. They’re more than able to dig through this allegation, which is looking shoddier by the day. The columns by Booker, a potential 2020 presidential contender, have resurfaced after he became one of the leading voices of the Democratic opposition against Kavanaugh’s confirmation. Following allegations of sexual misconduct against Kavanaugh, which he vehemently denied, Booker said the accusations are “serious, credible, and deeply troubling.” After the committee vote was delayed and Senate Judiciary Committee Chairman Chuck Grassley invited both Ford and Kavanaugh to testify on Monday, Booker called for an FBI investigation before holding a hearing. "Our groping ended soon and while no 'relationship' ensued, a friendship did. You see, the next week in school she told me that she was drunk that night and didn't really know what she was doing." …that column puts the senator in an awkward position regarding the allegations against Supreme Court nominee Brett Kavanaugh by psychologist Christine Blasey Ford. "It takes enormous courage to come forward publicly as Ms. Ford has," Booker said the other day. "The Senate owes it to her and every survivor of sexual trauma to listen to her story and gather all of the facts before moving forward with this nomination." Ford had 35 years to make her allegations against Kavanaugh. Yet she didn't bring them up privately until she went to therapy in 2012. Memory is just not that reliable. And that includes Booker's memory. Every politician exaggerates, you might say. Give him the benefit of the doubt. Okay. But based on that Stanford Daily column, Booker should be giving Kavanaugh the benefit of the doubt as well. The point of it was that the future senator had "a wake-up call" and decided "I will never be the same." Back in the 1990s, a lot of people were jailed before the idea of repressed memories was debunked. The credit goes to The Wall Street Journal's Dorothy Rabinowitz, who dissected many of the worst cases. Here's a good piece on "The Myth of Repressed Memories" that should be required reading for every senator on that committee. When it comes to this sort of thing, I suspect the only people easier to fool than psychologists are the editors of Rolling Stone. But they're not on the Judiciary Committee. Mulshine then noted how he hopes Ford shows up and testifies, hopes Kavanaugh will be afforded the same courtesy in responding, and have the Senate Judiciary Committee do its job. Circling back to memories, his high school reunion is around the corner. And yes, things are a bit hazy recollecting the good times with his friends from St. Joseph’s High School in the 1960s. It still doesn’t negate the fact that this allegation might be too old and too unprovable to be taken as a possible development that could derail this nomination. The GOP is digging in, and the timing has already cast the move as politically motivated, which it is. Again, if it does succeed, it’s a dark day: any allegation without evidence at any point in someone’s life can be used to destroy nominees. That’s what Democrats want apparently. As for Booker, well, it looks like he’s just any other two-faced Democrat, someone who could get away with it because of their party affiliation. If the roles were reversed, you bet this would be a bigger story.